RILSIM is available only as a download, with an individual installation module for each of the language versions shown below. The installation module installs the financial simulation software, a comprehensive online help system, the User's Guide, and a report from the Tropical Forest Foundation on the costs and benefits of reduced-impact logging. Current software version: 2.02, dated 2009. User's Guide: The capabilities of the latest version of RILSIM are essentially as described in the RILSIM 2.0 User's Guide, which is available in the language versions listed below. Each RILSIM installation includes an electronic copy of the User's Guide. To open the User's Guide your computer must have the Adobe® Reader® or an equivalent PDF reader installed. If you do not already have it, the Reader can be obtained free of charge from the Adobe website. English, Français, Português: Installed with the associated language version of RILSIM as listed above. Español: Not yet available. The Spanish-language installation of RILSIM includes the English User's Guide. However, if you prefer you can download and install a patch that will substitute either the French or Portuguese version of the User's Guide. The option to install either of these patches will appear after you have downloaded the Spanish-language version of RILSIM, or you can get either of the patch installers via the RILSIM support page. If you'd like to access the User's Guide in any of the available languages prior to installing RILSIM, you can do so from the support page. Chapter 1 of the User's Guide is also available in the three available languages from the installation instructions page. Chapter 1 provides detailed information on how to install RILSIM. HTML Help: RILSIM Help has been upgraded to use HTML Help, a standard that is supported in all versions of Microsoft® Windows® beginning with Windows 98. This upgrade was undertaken especially to support users with Windows Vista, Windows 7, and Windows 8. These newer versions of Windows are not compatible with WinHelp32, the help system used in previous versions of RILSIM, unless a special patch has been applied to the operating system. More details are provided under the special note for RILSIM Français help files below. Side-by-side installations: The current version of RILSIM has been designed so that the different language versions can be installed simultaneously on a single computer and will not interfere with each other. While most people will not need this capability, it might be useful for workshop instructors or for analysts who work in more than one language. Ability to share files among all language versions: The original Portuguese translation of RILSIM, which was released exclusively in Brazil in 2006, incorporated a translation error that prevented users of the Portuguese version from reading files produced with other versions of RILSIM. Likewise, non-Portuguese versions could not read RILSIM files produced with the Portuguese version. The latest release of RILSIM corrects this problem so that all language versions can now read files produced by any previous or concurrent version of RILSIM in any of the supported languages. 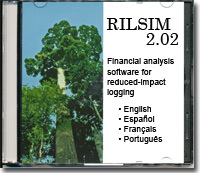 This includes data files produced with the original Portuguese version of RILSIM. The help files used in the French version of RILSIM have not been upgraded to HTML Help. The older help system, WinHelp32, is not supported by default in Windows Vista, Windows 7, or Windows 8. However, if you wish to use RILSIM Français and your computer has one of those operating systems you can download and install a patch from Microsoft for Windows Vista, Windows 7, or Windows 8 that will permit your system to display the RILSIM Français help files. Microsoft's policies do not permit us to include these patches with the RILSIM installation module so you must download them directly from Microsoft. If you are using Windows 95, it's important to note that you must download a different installation module than if you have any later Windows operating system. Windows 95 is not compatible with several visual enhancements that have been incorporated into the latest version of RILSIM. However, this affects only the user interface; the functioning of the software is essentially identical under all supported Windows operating systems. Nevertheless, the version of RILSIM developed for Windows 98 and later operating systems will not run under Windows 95.